An automatic pool cleaner is a device that cleans your pool. Instead of using a telescoping pole and net to manually clean your pool, an automatic pool cleaner can be set to clean at certain times, ensuring your pool is consistently clean. What Types of Automatic Pool Cleaners are There? 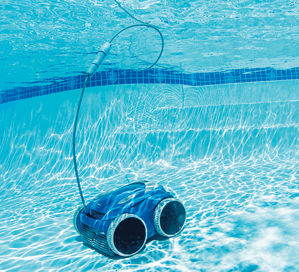 There are three types of automatic pool cleaners; pressure-side, suction-side, and robotic. A pressure side pool cleaner uses the water from your pump and filter system to power the cleaner. This type of cleaner moves around the pool and creates a vortex to pick up debris as it’s fueled by water pressure. Pressure-side cleaners are able to easily pick up large debris, require little maintenance, and are durable. A robotic pool cleaner does not use the pool’s pump and filter system to clean. This type of cleaner uses a low-voltage transformer system for power. It has it’s own motor that moves the cleaner, and its own pump to lift debris off of the ground. Some robotic cleaners are equipped with a computer that can make it clean more efficiently. There are also remote-controlled robotic pool cleaners. With advances in technology, robotic pool cleaners are becoming more affordable and more efficient. Robotic pool cleaners are able to clean up both, large debris and small debris. They are able to scrub the tiles, walls, and stairs of your pool. Lastly as a self-contained unit, this type of cleaner is not connected to your filtration system, however, as it cleans, it actually filters the water itself. Suction-side pool cleaners require the pool’s pump and filter system to run. This cleaner moves along the floor and walls of your pool, picking up debris and placing it into your pool’s filtration system. Suction-side pool cleaners are the least expensive option. What Should You Look for in a Robotic Pool Cleaner? If you opt for the convenience and versatility of a robotic pool cleaner, there are few things you should consider. Wide, four-wheel drive wheels make it easier for you cleaner to get everywhere it needs to go in your pool. Of course, the size of the robot you need will depend on the size of your pool, but be sure to go with a lightweight option, this will make it easier to get in and out of the pool. If your robot needs to be plugged in, many do, however there are some that run on battery, be sure it is equipped with a swivel cord. This feature prevents the cord from tangling as the cleaner moves and climbs. Getting the dirt and debris off of the surface of your pool is the sole task of your pool cleaner, this makes high quality brushes a must. Hard bristle brushes or rotating rubber brushes perform the best. While pool maintenance is a vital part of pool ownership, it shouldn’t have to be a chore. Automatic pool cleaners keep your pool and its water clean and healthy, without monopolizing your free time. Lucas Firmin Pools builds and maintains custom pools in the Baton Rouge area.